#DOTE2017 has ended. Together with our visitors, we’ve celebrated 10 years Dancing on the Edge and were treated to 11 days of intriguing performances, installations, meetings, workshops and talks in 12 different locations across The Netherlands. 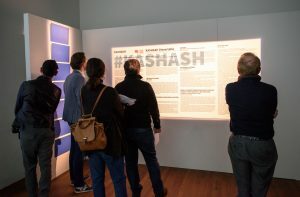 At our opening in The Hague we kicked off KASHASH in collaboration with Syria Sixth Space. The artistic research project focussing on the practice of pigeon breeding in Syria travelled with the festival in the form of an exhibition, with curator’s tours, and KASHASH Talks, open talks with international guests. Missed it? No worries! We’ve recorded the talks and will soon be sharing them on our website. And we can look forward to Syria Sixth Space’s publication about KASHASH in spring 2018. The site-specific performance at the seaside A Ticket to Atlantis created a buzz in The Hague, where it played a full week, and attracted visitors from all over the world. 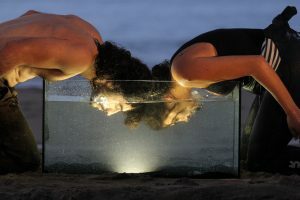 The performance about the sea, based on stories from refugees who crossed it and others with strong connections to the sea, has been covered by national and local Dutch media. Check out some of the stories here in De Volkskrant or NRC. We will soon be sharing all the pictures, videos and the aftermovie of the festival on our Facebook page, so follow us there if you want to stay updated. Sad that it’s over? Don’t be! Dancing on the Edge organizes many events throughout the year. Like the exhibition House of Wisdom at Framer Framed launching in Amsterdam this week. And of course, in the fall of 2019 Dancing on the Edge will be back with another festival. We thank you for coming and hope to see you at #DOTE2019!